A substance reacts to graphene even with minimal concentration, while with hydrogel and sulfur-containing molecules there would not be any reaction. Moscow scientists have created graphene-based bio-sensor chips that will make drug and doping tests faster and cheaper. This breakthrough is already protected by patent in Russia, and is currently being patented in the U.S.
New bio-sensor chips can improve drugs tests for HIV, hepatitis, herpes, and cancer; but they will also speed up and improve the quality of doping tests. 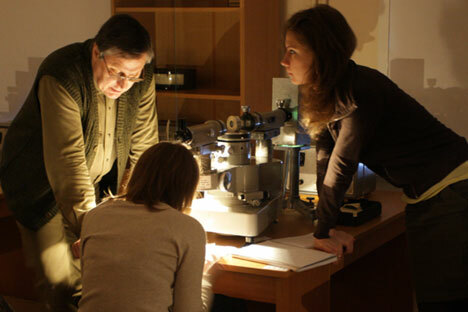 "Now we are working on creating hypersensitive sensors for precise analyses and pre-clinical drug research with low molecular mass," Yuri Stebunov, a scientist at the Moscow Institute of Physics and Technology (MIPT), told RBTH. Andre Geim and Konstantin Novoselov, who in 2010 won the Nobel Prize in physics for their experiments with graphene, are also MIPT graduates. Now the institute's researchers have come up with this extraordinary idea. While using bio-sensor chips to obtain information on the effectiveness and toxicity of future medicine is not new, MIPT researchers have improved this technology dramatically. They substitute the connecting layers in existing chips with a thin film made of graphene plates, which helps increase the precision of the analysis of biochemical reactions almost threefold. It is expected that in some cases the improvement might be 10 or even 100-fold. Sensitivity increases thanks to graphene's unique chemical and optical features, the first real two-dimensional crystal. A substance reacts to graphene even with minimal concentration, while with hydrogel and sulfur-containing molecules there would not be any reaction. Scientists say that using this method will reduce the time needed for conducting analyses from days to minutes. In addition to a higher level of sensitivity than existing technology, the graphene-based chips can be used multiple times, thus greatly reducing the cost of conducting biochemical studies. According to preliminary MIPT estimates, if produced on a mass scale the cost of a graphene oxide sensor chip will be less than $10. Currently, the market cost of a chip ranges between $50 and $200.